In a certain special situation, the law expects greater care than just a reasonable one form a person when he does something which is not natural or dangerous in nature. In such case, it will be no defence that the act was neither intended nor negligent. The wrongdoer is held liable without intention or negligence on his part. These are called the case of strict liability. Strict liability often applies when people engage in inherently dangerous activities. There are many factors a court will use to determine whether or not an activity is inherently dangerous. Some activities, such as transportation or use of heavy explosives or dangerous chemicals, are inherently dangerous in any circumstance. Other activities may be dangerous, but not inherently dangerous enough to trigger strict liability. For those activities the law will look at the possible level of harm the activity could cause, whether or not such an activity is common or expected in the place it is being conducted, and whether or not the activity is necessary. For example, a construction company using some sort of blasting technique on a job may not be inherently dangerous in an unpopulated area if adequate safety precautions are met, but can be inherently dangerous if done in a crowded city. If a construction company is conducting blasting activities in a crowded city, and if the blasting causes harm to someone the company can be liable for any personal injuries under a strict liability tort theory. It does not matter if the blasting was properly monitored in order to ensure the safest possible technique because if an activity is inherently dangerous considering the place and time it is conducted and a plaintiff suffers an injury as a result of that conduct, then a strict liability action negates any defence. Inherently dangerous activities can include acts by the defendant, transportation of various materials or explosives, or keeping dangerous animals that can cause harm to others. A plaintiff in a civil cause of action must generally show three things to establish a strict liability offence. The first is that a defendant (person or company) did something that was inherently dangerous and unreasonable under the circumstances. The plaintiff must then show that the inherently dangerous act caused something bad to happen to the plaintiff. Finally, the plaintiff must show they actually suffered harm as a result of their injury. If a plaintiff cannot show an actual harm, such as a physical injury, they may not be able to make their strict liability claim. Once a plaintiff proves a strict liability personal injury claim, a defendant is pretty much on the hook for the damages, regardless of their disclaimers. Disclaimers and waivers of liability for products are often invalidated by courts as against public policy (courts should not condone the manufacture and distribution of defective products) and warranties are typically limited so that manufacturers and retailers are held responsible for personal injuries caused by the use of the product. Fact: Rylands employed contractors to build a reservoir, playing no active role in its construction. When the contractors discovered a series of old coal shafts improperly filled with debris (ধ্বংসাবশেষ), they chose to continue work rather than properly blocking them up. 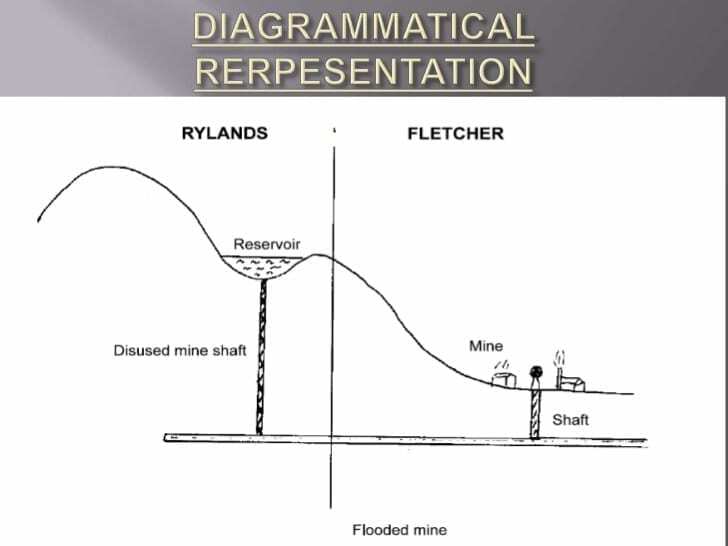 The result was that on 11 December 1860, shortly after being filled for the first time, Rylands’s reservoir burst and flooded a neighbouring mine, run by Fletcher, causing £937 worth of damage. Fletcher brought a claim under negligence, through which the case eventually went to the Exchequer of Pleas. The majority ruled in favour of Rylands; however, Bramwell B, dissenting, argued that the claimant had the right to enjoy his land free of interference from water and that as a result, the defendant was guilty of trespass and the commissioning of a nuisance. Bramwell’s argument was affirmed, both by the Court of Exchequer Chamber and the House of Lords, leading to the development of the “Rule in Rylands v Fletcher”; that “the person who for his own purposes brings on his lands and collects and keeps there anything likely to do mischief if it escapes, must keep it in at his peril, and, if he does not do so, is prima facie answerable for all the damage which is the natural consequence of its escape”. No right “to enjoy property” exists in UK black-letter law, and it is this decision upon which stare decisis in the area. This doctrine was further developed by English courts and made an immediate impact on the law. Prior to Rylands, English courts had not based their decisions in similar cases on strict liability and had focused on the intention behind the actions rather than the nature of the actions themselves. In contrast, Rylands imposed strict liability on those found detrimental in such a fashion without having to prove a duty of care or negligence, which brought the law into line with that relating to public reservoirs and marked a significant doctrinal shift. Academics have criticized it, however, both for the economic damage such a doctrine could cause and for its limited applicability. Next story Why the presumption of innocence is so important?